In June I learned that Jim Hall's Chaparrals would be featured at the vintage races at Road America, near Elkhart Lake, Wisc., July 20 to 22. The event title was The Brian Redman International Challenge. Jim Hall was the Grand Marshall. The black and white photos on this page are from the event program. I called Cheryl Barnes, communications director at Road America to see if I could get some time with Jim Hall. The book I'm working on will try to explain some technical aspects of tires, vehicle dynamics, and shock absorbers. Jim Hall was one of the first technically educated people involved in designing modern racecars and I wanted to talk to him about his experiences. 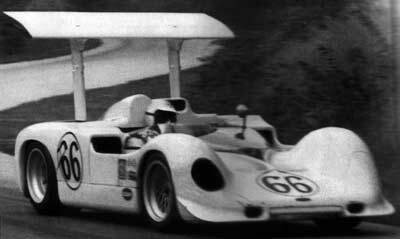 The event at Road America, was titled Can Am Thunder. I decided to drive to the track from my home in Springfield, IL. on Thursday, stay somewhere that night and drive back home Friday afternoon. After a few phone calls I found a room north of Milwaukee less than a half hour from the track. The drive up on Thursday proved uneventful taking about six hours. A friendly young lady quickly issued my credentials, and I found my parking pass into the into the paddock area right in the middle of all the racecars and haulers. Let me tell you that doesn't happen at CART or NASCAR events. As soon as I drove through through the front gate I heard the unmistakable sound of big-bore race engines so I stopped at the first grandstand I saw. The treat layed out before me was the sight of a bunch of old Can-Am cars roaring down the hill from the right, tip-toeing into Turn 14, and then blasting up the straight pounding the ground with their exhaust. Ten minutes later I got back in the car and drove to the media center. The rest of the afternoon I walked around the paddock looking at the cars, an impressive gaggle of historic racecars from mundane Triumphs to the almost unique Scarabs to Formula 1 cars less than 10 years old. 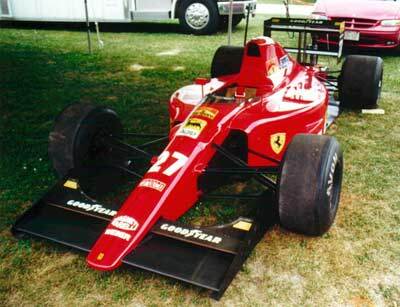 Maybe the most beautiful Formula 1 car of recent years is this Ferrari from 1991 owned by Tom Murphy of Wilmette, IL. 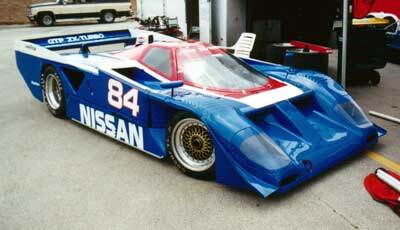 These next two photos are a 1988 Nissan GTP car. Note the size of the tunnels and diffusers. 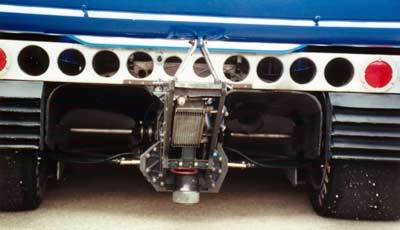 This car developed so much downforce that Goodyear had to make special tires to take the load. The low rear wing creates low pressure behind the car that propagates into the diffusers augmenting underwing downforce. On Friday just after noon I sat in the media center over my notes. Then Jim Hall appeared in tow behind Cheryl and he sat down followed by Brian Redman. Brian's appearance was a surprise to me. He's a subscriber to the newsletter and I've talked to him at various races finding him to be a charming and delightful guy. I had only prepared questions for Jim Hall so I would have to figure out how to get Brian into the conversation. We sat in three chairs in one corner of the media center and I explained the topics I wanted to cover. Jim started talking and I turned on the tape recorder. Almost immediately the other eight or ten people in the room began edging closer so they could listen in on the conversation without actually looking like eavesdroppers. 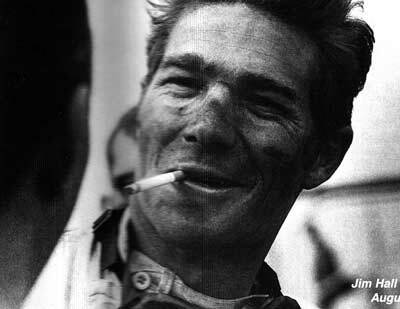 It didn't work because Jim soon included them in his words and gestures and we were just a bunch of racers listening to a pair of our heroes telling stories. As I transcribed the tape it was easy to recognize and differentiate the two voices. Brian's deep, rich British tones contrasted with Jim's tangy Texas drawl now softened by time and world travels. PH: Early on you bought racecars made by other people. How did you get started designing racecars? JH: I drove cars and tried to make them better. I'd make an educated guess as to what to do. And I used the feedback from the driver, which in my case for a long time was myself, which I think was pretty critical for my education. The feedback is kind of instantaneous and pretty reliable when you do it that way. I think that helped me a good deal. I got to do some work with what was probably some of the original instrumentation on racecars. Chevy R&D put together an instrumentation package because they wanted to know the numbers, not just the subjective driver feedback. So I got to see quite a bit of real data and that helped a lot. It's not anything like they have in data acquisition today but it was very useful even though primitive." PH: "That was going to be one of my first questions, did it matter being a driver. So you were an engineer and you had some ideas and you were a drivers so you got instant feedback whether those ideas were good or not." JH: "Yeah, I think that was really important to my career as both a designer and a driver. Sometimes I thought it helped me as a driver and sometimes I thought it hindered me a little because I was always thinking about ways that I'd like to make the cars better rather than just worrying about getting it around the corner. I think it might have hindered me a little bit in some ways but all in all, just looking at the guys I drove against and how I competed and so forth I was not unhappy because I felt like it was a good balance." PH: "You bought a Porsche Spyder early on. So that was one kind of car you looked at." JH: "Yeah, I didn't have any experience with Porsches up till the time I got to racing nationally in SCCA races. When I went to local races I always had a better car than the local guys so it wasn't good for them and it wasn't good for me." PH: "You had some good battles with Delmo Johnson [Jaguar D type with a Chevy V-8 engine] at Green Valley Raceway." JH: "Yeah, but that was a big car vs. a small car and that was good. I enjoyed those races. That was the real reason I got the Porsche and it was a great experience for me because it was a different handling car and it was a car that had a lot of racing history and I got to experience that. "I asked him how much it would cost and he told me and I said I'd take it. I went and got it and drove it one time at Green Valley and, to tell you the truth, I didn't like it at all. It really pushed badly and it wasn't fun to drive. "The next week I got a call from Roger Penske. I didn't know him at that point. He told me he needed an RS61 because Bob Holbert had one and was beating Roger with it. He suggested trading his Porsche RSK for my RS61 but we'd keep our own engines and gearboxes. He said make him a price. We figured out a deal and he sent one of his guys down with the car and we swapped engines and transmissions and he went off with the car. "The K was a helluva car. It would take a set real nice and you could drive it around a corner with the throttle and it seemed like it had a lot of cornering power. "We used to wonder, before we began to think of the science of it, why the little cars like the Porsches would beat the big cars. We'd go to the short tracks and they'd be all over us. They'd come off the corners a little quicker, they'd squirt for a little while, and they'd go deeper into the corners on braking. I'd wonder why I was having so much trouble staying ahead of this guy in this little 1600 cc car. What it was was he had about the same size tires as I did but the car was a lot lighter. He got a lot more cornering power than I did. That wasn't so obvious to everybody in those days, how important the tires are." PH: "We know now how important tires are. For both of you, Jim and Brian, has there been some time when tire development jumped ahead and you went seconds faster? [At last I had figured out how to get Brian in the conversation.]" BR: "I was driving a Lola T70 Can-Am car in England in 1966. We were running on Dunlop Green Spots, I think." JH: "Only about five and a half inches of tread on those, I think." BR: "Bruce McLaren was the official tester for Firestone tires. They brought three of their cars to Oulten Park in North England which was only an hour from where our car were garaged. The McLarens all blew up and the Firestone people asked us if we could bring our car to fill in the next day. We did. Firestone had a wider tire that was almost a slick and we went four seconds faster than our previous best." JH: "That tire had almost no tread, only some little sipes cut in it." BR: Even then the wider, slick tires didn't get going for several more years." JH: "During that time I was with Firestone. Bruce and I were the guys that ran Firestone tires. I did the testing in the States and he did it in England. When we first built the so-called automatic car it was a single speed torque converter, with no transmission. All you did was put it gear and go. It had a two-to-one torque multiplication out of the torque converter so it was like having a high second gear. On the Dunlop Green Spots, the best tire we could get, we could spin the tires from about 10 feet out of the gate up to 80 mph or something. So we thought why do we need anymore transmission than this. It was fine not having any gears. "Then I got with Firestone and they brought us development tires. The first tires we got were wider than the Dunlops. They had an inch or so more tread on the ground. We were runnin' 7-inch rims in the back I think or maybe 6-inch in the front and 8-inch in the rear. Or 5s and 7s. I don't recall exactly. They were 15-inch diameter wheels. We put the Firestones on and tried them in our skidpad testing. "We had started runnin' skidpad tests, just going round and round on the skidpad. We did a lot of tire testing and that's the way they checked the friction coefficient to see what kind of cornering power you're actually getting. We got good at it and we found out we could balance the car this way. You could put the car on the scales and balance the weights but you go out there on the skidpad and it won't turn the same both directions because somethin' is amiss in the car. "It was a little bit more technical than we could figure out. Either the chassis was tweaked a little bit or the caster was off on one side or somethin' and you'd find out running around on the skidpad that, in one direction, it would go up to 0.98 Gs and only 0.92 the other way. "That skidpad was really handy. We'd crank a little weight in the car to balance it. You could look at the camber by looking at the temperature across the tire. We found a little time on the skidpad made a big difference, made a nicer car. We started setting up all our cars that way. We'd get them all ready to go to a race and we'd go a few rounds in both directions and make sure it was balanced. That was good for slow speeds, about 40 mph, and then we'd go out and run through a hig-speed turn, 150 mph, and we'd see how it was balanced. That was the way we set the aerodynamic balance. "So Firestone told us their tire was built to run on a 7-inch wide rim. I had built some modular wheels and we could vary the width by what mid-section parts we used. We'd run the tires they gave us on a 7-inch rim and maybe an 8 and a 9 too. The wider rims made the sidewalls stiffer and istead of running a 0.95 average G you'd run a 0.99. So of course we put them on 9-inch rims. "Well, we'd go to the next race and the Firestone guys would look at them and say, 'We didn't design those tires to run on a 9-inch rim. We better build a new tire.' They'd add an inch to the tread. They'd do them quick too. They can build prototype tires in a hurry. In a couple of weeks they'd have another tire. And we'd run it on a 9-inch rim and a 10 and maybe an 11. And we'd find it was better on a wider rim so it would happen all over again. "In a matter of less than a year we went from those narrow little Dunlop Green Spots to a tire that was almost double the width. And our single-speed torque converter just couldn't handle all that grip. We immediately went to a two-speed transmission so we could get more torque multiplication off the slow-speed corners. "So that's what happened with me on tires. In the middle 60s, probably 64/65, Firestone took us from less than 6 inches of tread with up to 12 inches." PH: "Just because you kept skidpad testing them on wider rims." BR: "Speed is the criteria, at the end of the day. Speed on the skidpad is speed around the racetrack." JH: "Cornering speed is the key to everything. You can have more horsepower, you can accelerate fast but you got to stop it at the other end. But, if you leave the corner just that much faster, you carry that speed all around the racetrack. The whole thing is cornering speed, basically." Interview continued. Links to the other pages are on this page above.